The DeKalb Sycamore Area Transportation Study (DSATS) is the Metropolitan Planning Organization which administers the federal and state funding for highway and public transit projects in the DeKalb Urbanized Area. 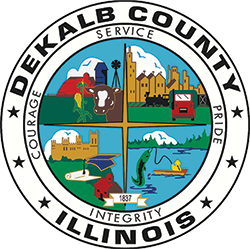 DSATS is staffed by DeKalb County and all activities performed by the organization are overseen by a Policy Committee (PC), with the technical oversight of the organization performed by a Technical Advisory Committee (TAC), and DSATS staff. In the U.S., urbanized areas with populations over 50,000, are required to create a Metropolitan Planning Organization. The Federal Highway Administration defines Metropolitan Transportation Planning as the process of examining travel and transportation issues and needs in metropolitan areas. It includes a demographic analysis of the community in question, as well as an examination of travel patterns and trends. The planning process includes an analysis of alternatives to meet projected future demands, and for providing a safe and efficient transportation system that meets mobility while not creating adverse impacts to the environment. In metropolitan areas over 50,000 population, the responsibility for transportation planning lies with designated Metropolitan Planning Organizations. For example, racially neutral policies or practices that result in discriminatory effects or disparate impacts violate DOT’s Title VI regulations, unless the recipient can show the policies or practices are substantially justified and there is no less discriminatory alternative. In addition, Title VI and DOT regulations prohibit recipients from intentionally discriminating against people on the basis of race, color, and national origin. The DeKalb Sycamore Area Transportation Study operates a Title VI program to ensure all residents, workers, and vendors have equal access to involvement in the transportation planning process, access to transportation, and the ability on transportation funded projects. County offices will reopen on Monday, April 22, 2019. Please check with individual offices for office hours.